Why do diets initially work, but, over time, fail to keep the weight off? Why are many of us subject to so-called yo-yo dieting, in a never-ending S-curve of fluctuating pounds as measured by a scale? Why do people with good intentions work so hard to become thinner, only to end up frustrated and defeated? By exploring these and similar questions around the issues of exercise, nutrition, and heal… th, Ashly Torian developed the E.N.D. (Embrace~Nourish~Digest), a sustainable, natural way to a healthier lifestyle. The E.N.D. is not a weight-loss program. Its not a fad diet. But by integrating the elements of Embrace~Nourish~Digest into your daily life, you will lose the weight and it will stay off. 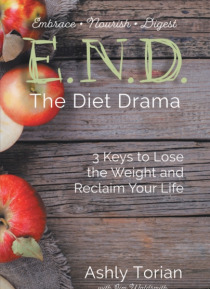 If you are in an unhealthy relationship with food, the E.N.D. will help you find the balance thats best for optimizing your bodys potential. Thats because the E.N.D. is a mindset, a way to think about who you are, what you want to do, and the body you need to do it.